One of the wonders of the movies is how a thousand takes, and the days, weeks or months of frustration behind them, can produce something so smooth on-screen. I’ve heard about Charlie Chaplin’s working methods. About the obsession. The perfectionism. The relentless drive for the perfect moment, and the tyranny he could wield over actors who stretched out the process even further. Deadlines, budgets—they were just further distractions. But the results? Sublime; smooth. Flawless, clean motion; dangers averted by the slightest of movements—millimetres, for example, separating the base of the Tramp’s cane from the opening of a sewer grate. The cane lands on the bars of the sewer again and again, never with Chaplin seeming to guide it. And when it falls through, allowing us the sight gag we’ve been waiting for, it is only when the time was best for the master. 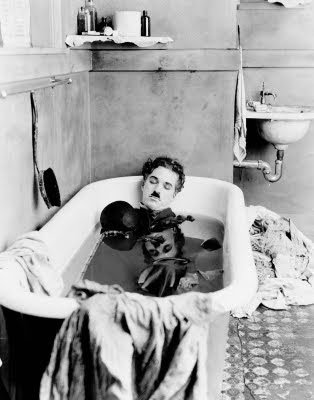 That moment is one of many in Pay Day, my favourite Chaplin short. It was also his last, before he began the epic phase of his career that brought about feature-length classics like City Lights (1931) and Modern Times (1936) and further accolades. Those films carry with them a burden of melancholy that grew along with Chaplin’s fame. But Pay Day’s just funny. From the moment it begins to the final fadeout over the Tramp’s bruising, gorilla of a wife (Phyllis Allen), howling at her no-account bricklayer husband, and also, it seems, at us. Pay Day is divided almost evenly into three acts—the first set at a construction site, where the Tramp works as part of a labour crew under a turnip-shaped foreman (Mack Swain). The second details the Tramp’s night on the town with the boys, or at least, its drunken aftermath. The final act, set at 5 a.m. chronicles his journey home, where damnation awaits him in a nightgown. Allen, surely one of the most intimidating women ever filmed, could collapse ten Tramps with one sweep of her rolling pin. 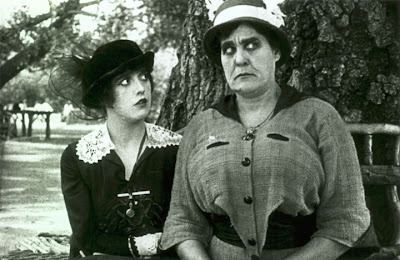 Phyllis Allen (right) with Mabel Normand. 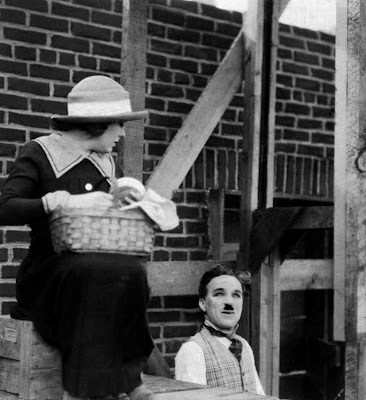 Several gags in Act One involve a swift elevator, upon which workmen, and the foreman’s fetching daughter (Edna Purviance), can rise and lower themselves along the scaffold. Lunching workmen have a tendency to set their food on the elevator platform, which seems to move without warning and then deprive them of their eats. The Tramp, more than once, is the beneficiary. Act Two finds the Tramp and his sloshed cronies singing tunes outside the local beerhall, late in the evening. Here we see the sewer-grate gag, along with several creative attempts to don a coat—much of this being the sort of sight-gag Chaplin would have mastered on stage in his early days. The gem, though, is the drunken Tramp’s attempts to push his way into an overloaded streetcar. He gets numerous shots at this, though it isn’t always the same car—other drunks bulge in clumps out the vehicle’s windows and hang off its rear steps. When he finally succeeds, the building mob forces him all the way through the car and out the other end, like the innards of a squashed sausage. While the Tramp stumbles into Act Three, Pay Day remains a comedy-of-positioning. For the Tramp to survive his wife’s wrath, he must seem to be where he is not—in other words, he must not look guilty. She is never, for a moment, charmed or fooled by his tricks. And after scenes of his carousing, spending and (attempted) womanizing, we figure he’s earned his demon-spouse. If he was a better man, or even just a smarter one, he’d be somewhere else. Like the streetcars in its second act, Pay Day feels filled to brimming. Every minute springs a joke or builds to one. However, if you pause to think about the film on a different level (it does reward repeat viewings) you will notice calmness. The ease with which Chaplin executes his difficult tricks is not just the result of talent plus take-after-take; it’s helped by our realization, as audience members living in the real world, that the farce in Pay Day is driven by people doing normal things. Yes, there are caricatures in front of us, but are they acting strangely? Is anybody over-the-top? No. The foreman kicks Chaplin around because Chaplin’s playing a lazy man. (The wife does the same thing for the same reason.) The foreman’s kicks don’t propel Chaplin much of a distance, because the point has already been made. One sequence—otherwise, not one of Pay Day’s most memorable—sums this up. The Tramp leans backward on a barrel, set on the elevator floor. He doesn’t see that someone at ground-level placed a hot soldering iron on the barrel. The Tramp jumps, but doesn’t burst into flame or anything. On the level above him, the foreman asks what he’s up to—and the Tramp hands him the iron, of course holding the only cool end. The foreman grips the hot end, immediately releases it, and it falls to the ground. A fat worker, lying around on the ground during his lunch break, hears the commotion above, but can’t see when he looks up, because of the scaffolding—so he naturally rolls over, and onto the hot iron. One sequence, three jokes, and no matter how outlandish the result, anyone of us could have landed in that predicament. How far removed are we, then, from a farcical world? Folks, that right there is Chaplin. French distributor MK2 owns the rights to most of Charlie Chaplin’s later works, distributed in North America by Warner Brothers. Pay Day, along with A Dog’s Life (1918), Shoulder Arms (1918), The Pilgrim (1923), and other films, can be viewed as part of The Chaplin Revue, a two-disc set. This link provides some information.